This Thursday Evening, our CEO, Doug Staneart, will be leading a Free Webinar called PowerPoint Tips: The 10 Biggest PowerPoint Mistakes and How to Avoid Them. One of the things that we've found conducting over 1000 Fearless Presentations Seminars is that one of the biggest causes of Public Speaking Fear is the way that a person designs his/her PowerPoint Presentation. Design it wrong, and your nervousness increases exponentially. Design it right, and you'll be poised and confident. 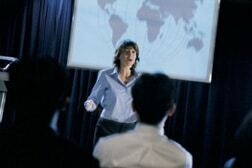 The 10 Biggest PowerPoint Mistakes and How to Avoid them. The simple mistake that, if you do it, will cause your presentation to fall flat every single time (and what to do instead). A strategy that will increase the clarity of each slide ten-fold. How, often, the things we do to make our slides look prettier actually cause the audience to be confused. Everything your boss and coworkers have ever told you about charts and graphs is absolutely wrong -- and once you know this secret, you will tower over them. How just physically moving two feet in the room can give you more confidence and authority on your topice (seriously -- two feet, and it's not what you think). And how if you let someone else design your slide deck, you'll increase your nervousness exponentially. If you'd like to attend but can't make it, register anyway, and we'll send you a link to the replay so you can watch it at your leisure.